As the largest city in central Illinois, Springfield is best known for being the home of Abraham Lincoln and is the capital of Illinois. The focus of the city’s Public Works department is to maintain the city’s infrastructure while serving close to 118,000 residents with water, storm, and sewer services; in addition to, a well-maintained transportation network. The winter months bring an annual average of 22 inches of snowfall to Springfield ever year, and one of the biggest challenges for the city is how to manage snow removal on 625 miles of roadway efficiently. In the past, this was largely a manual, paper-based process, with quite a bit of communication latency between shifts and crews. 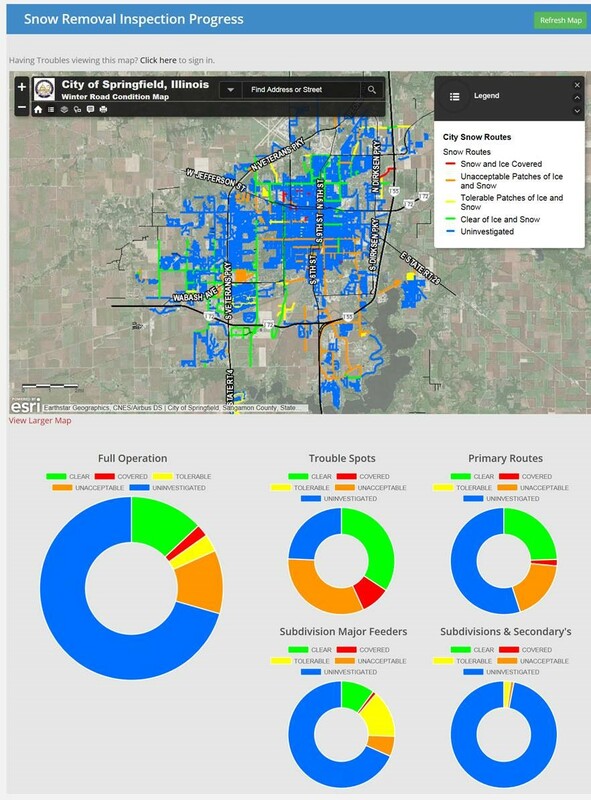 Springfield needed a better way to manage, track and resolve snow related issues, and as a technologically progressive entity, they turned to GIS for the solution. As technology has progressed, it has created a paradigm shift in the way large amounts of information are managed. True to form, and with a strong technological drive, the city embraced this newer technology in part by implementing Cityworks to support comprehensive management of their assets. As a GIS-centric application, Cityworks has enabled them to not only manage assets at an enterprise level, but also have those asset maintenance activities powered by and integrated with their GIS. In combination with Cityworks, the city has adopted the Esri ArcGIS platform to create an approach that helps snow removal processes. They were able to accomplish this through a series of observation based asset (snow route) inspections within Cityworks, that results in a score assigned to that route. This score is then represented within the GIS to thematically display each route based on its current condition. This information, in turn, is then consumed within ArcGIS Online and published via a web application. GISinc worked with Springfield to help ensure that the data structure within Cityworks and GIS would support this type of inspection process. 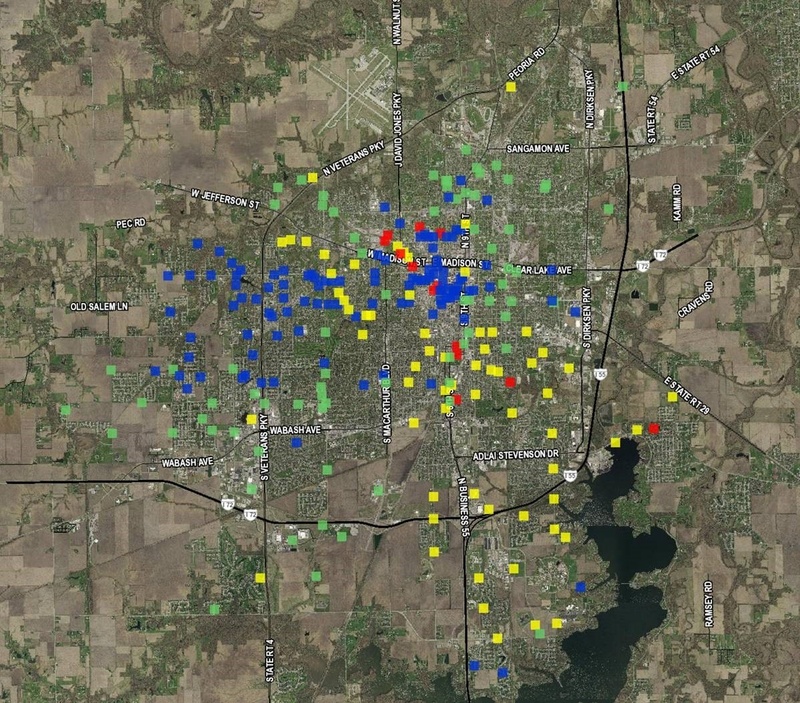 The city has taken the asset information and developed a web application that integrates not only an ArcGIS Online map, but also wheel charts containing analysis using data from both Cityworks and ArcGIS. The information being presented through the web application is real-time as the inspection is completed; updates to inspections in Cityworks are instantly reflected in the Snow Tracker application, along with the associated analytical data. By 2017, this information will also be available to the public through the city's website and social media pages, allowing individuals to monitor routes they take regularly. Following implementation, the city has seen snow event management activities become much more fluid, with greater amounts of information being easily available to decision makers. It has also enhanced the city's communication efforts and the customer service level to its residents. Without GIS-centric technologies, such an approach would not be possible. The city plans to introduce the web application to the public next snow season in hopes of providing near-real-time information to the community.